Do you have a Playseat® gaming chair and want to prevent any damages to your floor? With the Playseat® Floor Mat you don't have to worry about a thing! This mat has an antislip layer on the underside to keep your chair in place, even during the most intense gaming sessions. 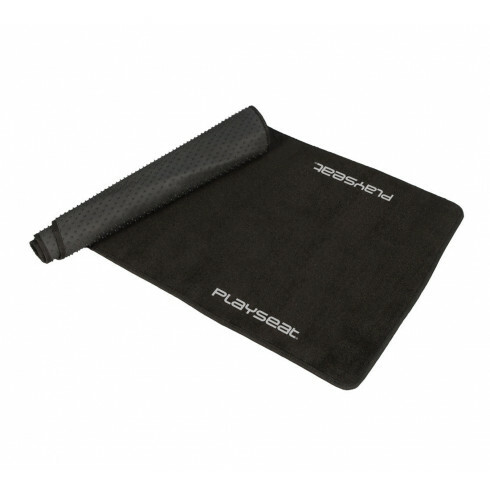 The Playseat® Floor Mat features Playseat® logo's on the upside and can be used with all Playseat® gaming chairs. I have been debating building a racing SIM in my house for a while now as I'm a lower leg amputee. I managed to try a gaming racing seat but positional comfort wasn't working for me as my bionic bits and pieces were getting in the way so I managed to try a PlaySeat which was perfect. As I was trialling the seat and getting excited racing I was sliding all over the place as there was nothing to keep me static and having no sensation it then took away my concentration from the racing. Now with the addition of the PlaySeat format I am anchored to the ground without any physical attachments and I am not moving around at all which means I can concentrate on the racing. This is a brilliant mat and the most essential foundation for improving the gaming seat experience. A MUST BUY for any racer. I got this in the Project Cars 2 kit and thought it was actually a really good idea considering it protects the surface of the floor that you're going to put the sim seat on, the other added benefit is it's a very similar carpet to what's actually in most cars, so it's a little more of your car while playing your favorite racing games! I think this is another must have accessory. It completes the chair and makes it look even sharper while protecting your floors and not sliding. After all Set, me and my friends are having a blast on dirty rally. To the staff Thanks for all the help and patience with me. For all of you out there if you have a wheel and no seat, dont think twice. Get yours today and your whole experience will improve tons. The mat helps the chairs stay in one place and does not slide as my son plays. The Playseat Floor Mat is essential to protect the floor and to give the final touch. I am very happy with my purchase and I highly recommend it. I purchased this for my son for his birthday to use with his racing seat setup. Delivery was very fast and efficient. The price was very good. "The Mat actually grips the rug really well". Maybe not mandatory, depends of your floor mat. As mine is made of wood, it prevents damaging it by accidentally moving while playing. Can be a bit tedious to clean but it's the only small bargain I have. A very good quality mat to suit your Playseat. This logo mat will enhance the overall Playseat setup. The Playseat(R) Floor Mat is Part 2 of our purchase. Part 1 was the Forza Playseat. These purchases transformed how I play auto racing video games. These were "gifts" from my wife who thought I should have a dedicated space aside from our family room! With a TV mount that drops the screen to Playseat level and far better control of the steering and pedal accessories, enjoyment is incredibly better. 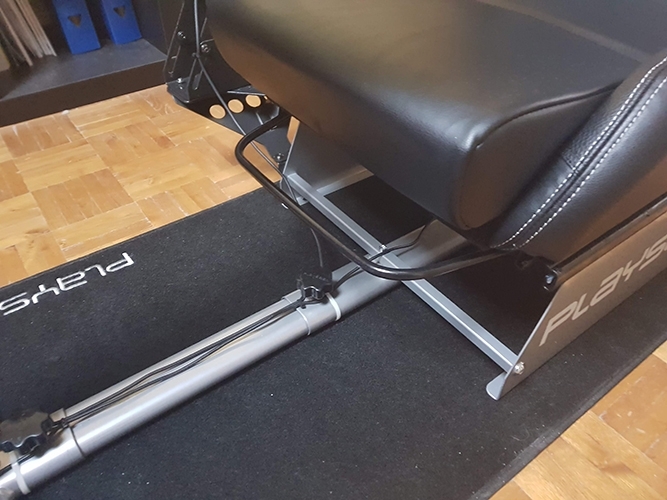 The mat is tailored to the Playseat, providing complete protection of our hardwood floors and assuring stability during ten 10ths moves on the track. Thanks, Playseat! _ to keep my rudder pedals in position. In addition the mat itself is low profile and, well, black goes with everything ! A mat that fits exactly to the seat, prevents from scratches on the floor and improves stability. If you have the need to move the Playseat, for example to store it, this is a must have. As mats go, it's pretty stellar. The seat slides a little bit on it, but that can actually be helpful. The assembly was very, incredibly, insanely easy. It doesn't have any weird odors from the rubber or fabric, and it protects my floors perfectly! Everybody knows that if your building a racing SIM - Its gotta look cool. This definitely cleans things up, protects the floor and looks cool!! Being able to buy all the accessories in one place made it a lot easier for my choice in choosing a playset and the playseat floor Mat. Perfect size for whatever length you set up you seat to, even with long legs!!! Very easy to clean, great that it is non slip on my carpet, design is simple but very effective to suit its purpose. It looks great, protects your floor and improves stability of your Playseat or wheel stand. It's a simple product, but a must have. Not a necessity, but it is good to have this, as it adds a layer of protection to the floor.. quality product!! Bought this mat as my wheelstand kept on sliding away when racing. This definitely solved that problem. The wheelstand isn't sliding anymore and neither is the chair I'm using. It's perfect for a stone or wooden floor. However one small point of attention if you have a soft floor lining like me. (Novilon/Vinyl flooring) Then you will get indentions in your floor when using this mat due to the hard rubber bottom that keeps the mat in place. Not a problem if you're not moving your setup around. As final remark great quality mat that looks nice in an interior as well. It came all folded, thinking it won't go perfectly flat since of the fold. I was wrong. It was super easy to go back to perfect flat. Protect your floor and your seat. Well build, good quality. But need to vacuum it a lot haaa. Looks good and protects my floor. Quality is superb & definitely useful for your rigs ! With the purchase of my racing-seat, it was important for me that the seat would be easily adjustable to various lengths and heights. The seat is very easy to adjust, within 10sec you can have the whole seat adjusted from my preference(1.87m), to my girlfriends preference(1.65m). If you have a wooden floor, I recommend buying the Playseat Floor Mat, otherwise these adjustments might cause scratches on your floor. I cannot express how this mat has improved my life and not just my gaming. I bought it so that my chair would not slide around on the floor anymore. It more than adequately stops my chair from moving and thus as a result my times have improved. Keeps the seat perfectly in place. Wasn't sure if i was going to order it with the seat but it is a must have! Ok, if you have a carpet floor, you wont need this one. But on a hard floor like wood or stone you wont come along without a mat under your seat. I use it for my Challenge Seat and it protects my floor perfectly from scratces as also i wont slide around with the seat on the hard floor. And be honest, you already paid at least 250 for a seat, those bucks wont hurt you then at all for the grade of protection your floor gets then. Keeps your seat from damaging your floor! It makes your seat stay in it's place perfectly. Also good for stability. If you buy a seat and you don't have carpet flooring: this is a must have. This is really needed for the seat, the seat will not move on the floor, the seat is more stable and gives a professional look to the seat! and looks great! Really worth the money!